Baking soda ultimate shine. Kills 99.9% of bacteria. Harpic White and Shine deeply cleans by killing all germs and viruses, and leaving your toilet sparkling white clean. The formula provides excellent hygiene by eliminating E. Coli and Rotavirus. It's formulated with baking soda to give your toilet a shine and return your toilet to its natural gleaming whiteness. Instructions 1. To remove the cap squeeze pads on sides of the cap and unscrew. To replace cap screw tightly on till you hear a click. 2. Lift up the toilet seat and carefully direct the nozzle under the toilet rim. 3. Squeeze and apply slowly all around the bowl, allowing enough liquid to cover the bowl completely. 4. Leave for 15 minutes to disinfect then brush and flush. For extended disinfections leave overnight then brush and flush. 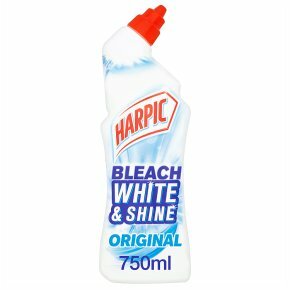 Precautions<br>HARPIC White and Shine Bleach Original<br>WARNING Causes skin irritation. <br>Causes serious eye irritation. <br>May be corrosive to metals.<br>WARNING! Do not use together with other products. May release dangerous gases (chlorine). <br>Harmful to aquatic life with long lasting effects. <br>Keep out of reach of children. <br>If medical advice is needed have product container or label at hand. <br>Wear protective gloves/eye protection. <br>Wash hand thoroughly after handling. <br>IF ON SKIN: Wash with plenty of soap and water. <br>IF IN EYES: Rinse cautiously with water for several minutes. Remove contact lenses, if present and easy to do. Continue rinsing. <br>If eye irritation persists: Get medical advice/attention.